One Sweet Kitchen invites you to nominate a deserving person or workplace to receive one of the French silk pies they're delivering every Friday in January and February for #FrenchSilkFriday. More details can be found here on the One Sweet Kitchen blog, or you can go directly to the nomination form by clicking here. "I was making a French silk pie last Friday and put a picture on One Sweet Kitchen's Instagram story wondering how #FrenchSilkFriday wasn't a thing yet," said owner Brittney Haskins, who is a sucker for both alliteration and themed days of the week. "The months after the holidays are a slower time for the business, so what better way to stay productive than by making pies and giving them to those who would love the surprise!" French silk is One Sweet Kitchen's most popular pie, and Haskins has had the recipe memorized since she was in grade school. 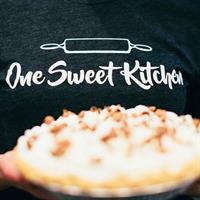 One Sweet Kitchen helps you create memorable moments for loved ones and clients by baking the best cookies and pies in central Iowa. They don't currently have a retail location; all orders must be placed in advance. Learn more by visiting onesweetkitchen.com or facebook.com/onesweetkitchen.